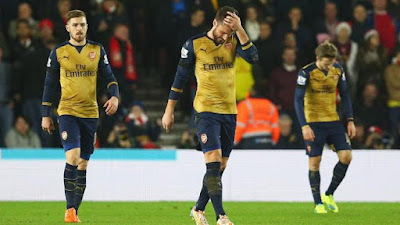 ARSENAL’S Premier League title ambitions were dealt a painful blow as they were not so much beaten as humiliated 4-0 by a Shane Long-inspired Southampton on Saturday. Favourites to win the title after their 2-1 victory over Manchester City, they knew that they could go to the top of the table by beating an out-of-form Southampton after Leicester City’s defeat at Liverpool earlier in the day. But somehow they made Southampton - short of confidence and goals and reeling from a 2-0 home defeat by Tottenham Hotspur a week ago - look like the team aiming for the top. “I got given my chance and I wanted to prove myself - that I could play,” Martina said. “It’s down to consistency, to fight in every single game, and find the resources to produce a top-level performance in every single game,” Arsenal manager Arsene Wenger said. But that error by the man from Rotterdam was soon forgotten. When Per Mertesacker headed away a routine cross from the left, any danger to the Arsenal goal seemed to have been averted until Martina hit the ball first time with the outside of his right foot, sending it curling past Petr Cech and into the bottom-left corner from fully 30 yards. Seconds earlier Theo Walcott had nodded wide at the near post from another Ozil corner, but Arsenal’s previous dominance was a thing of the past, and things got even worse in the opening period of the second half. “We lost too many challenges, they were sharper than us, and we were a bit unlucky as well,” Wenger added.